SFWA welcomes self-publishers | Thinking is the enemy. Times they are a-changin’. Much has been made of SFWA’s recent decision to clear the way for self-published science fiction and fantasy writers to join its top tier of membership, based on certified revenue. This led me to wonder what the other big writers associations were doing. MWA, the mystery writers association, is way behind the curve, with an approved list of publishers and a requirement that “Your work is professionally published or produced and is not self-published or cooperatively published” (emphasis mine). Now that’s just, well, horrific. The situation isn’t much better for the children’s book writers in SCBWI, who have to meet this criteria to achieve top-level PAL status: “The author/illustrator shall not have paid any money or consideration for the publication, marketing, editing and/or distribution or any other payment of their work in any format. This would eliminate all vanity publishing and subsidy publishing.” SCBWI is open to adding publishers to its approved list, but many small presses with a co-op model wouldn’t qualify. I should mention that all of these groups admit members at some level with little or no publication history. That said, I hope that the explosion in small press and indie publishing — and the many writers who find success in those channels — will eventually convince RWA, HWA, and SCBWI to revise their membership criteria. There’s so much to gain by including successful writers — no matter their sales channel — and so much community to lose. 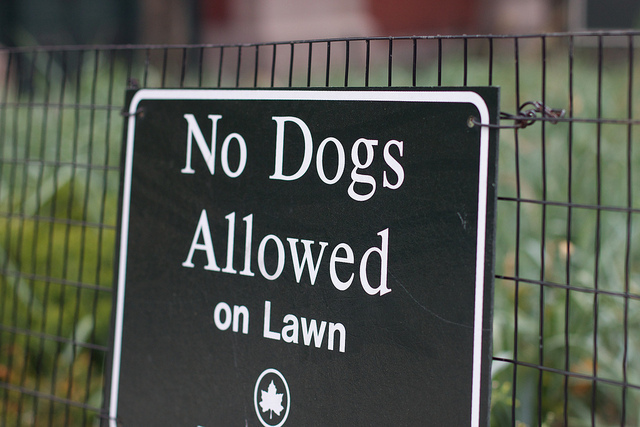 Photo credit: Stupid Rules by Alan Levine under CC BY 2.0. This entry was posted in Writing and tagged hwa, mwa, rwa, SCBWI, sfwa, writers, writing. Bookmark the permalink.